Almost a disaster in Istanbul. Day one in Istanbul and I thought I would do it all right, by the book as it were. Woken up at dawn by the first Call to Prayer of the day. My little hostel is between the Hagia Sophia and the Blue Mosque and with the muezzins chanting from both I as well and truly awake. Thinking creatively I got up thinking, the light, the light. Went up onto the roof and watched the sun come up over the other side of the narrow sea that runs through Istanbul, the Bosphorus, Asia. Truly spectacular and yes, the light was perfect. 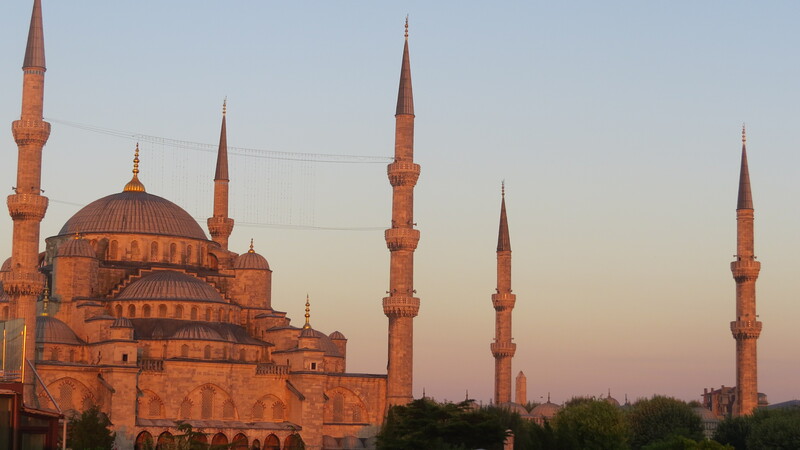 The Blue Mosque at sunrise. Back to my room and tried to sleep again, no such luck, so did the usual morning stuff except that all my shave jell had leaked, fortunately into the Heathrow security bag. Messy. Still early I went down to Pub Street for breakfast, yoghurt and honey with an omelet. Then off to explore the mosques. Walked about and admired the architecture then began to feel weird. Headed back to hotel and decided I had sunstroke. I didn’t do everything right, almost a total fail in fact. Got sick on day one! Drank two bottles of water, ate two packets of biscuits, slept for four hours and felt better, great in fact. Back out into the heat, it was about 90 (32C) and paid to enter the Hagia Sophia. Truly spectacular dome but the feeling of vastness was marred by reconstruction, scaffolding from floor to dome. A bit disappointing. Walked through the park like area to the Blue Mosque and sat outside for an hour, people watching. Will go in for a visit later when there aren’t so many visitors. 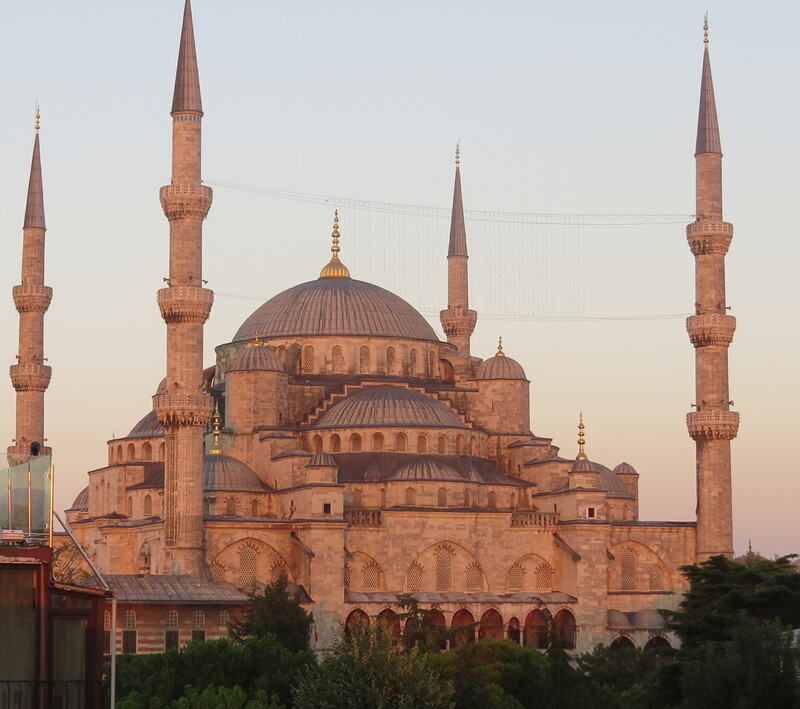 The day did not go exactly as planned and for a while there I thought “oh no”, but as evening falls, the temperature drops and the marvel of the Blue Mosque fills my view from the rooftop, hey, it could have been worse. Scotland, a great place to start. The soft green hills, the lilting accents all around which I can actually understand as I grew up with it. We used to live here in Edinburgh when I was a kid and up until some point I lilted too. There are men wearing kilts, unselfconsciously, big sporrans, big socks, all looking slightly fierce. Bagpipers play on street corners. The pubs are all open and everyone is enjoying their pints outside, its about seventy degrees. The taxi bounces over the cobblestones in the old part of the city as we pass the hoards of visitors for the Festival dragging their oversized suitcases. There are banners everywhere crying “YES”, for the coming referendum on Scottish Independence. Decide it’s best not to comment, foreigners shouldn’t get involved in local politics. Lording over it all sits the Castle, high on its lofty crag. Edinburgh is such a lovely city. Sister went to work so I went on a boat tour on the Firth of Forth. 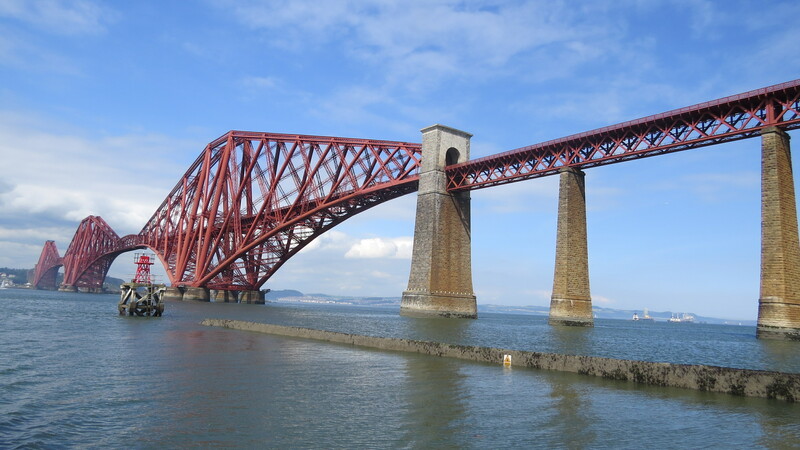 The Firth is the name for the estuary where the Forth river meets the North Sea. Quite wide, about a mile, it features a cantilevered railway bridge and a suspension bridge for vehicles which is on the point of collapse due to the enormous amount of traffic. They are building a new road bridge which will open in 2016. 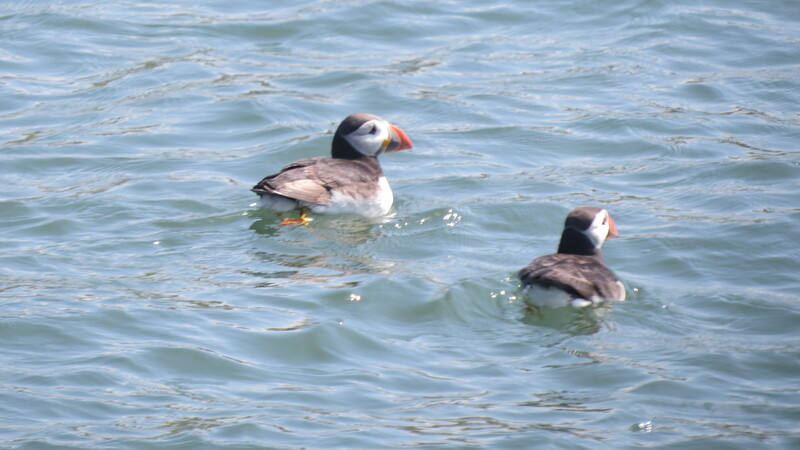 Apart from the bridges we saw the medieval abbey on the tiny island of Inchcolm, seals and a few puffins. The weather cooperated, the sun shone, sunscreen was applied, the bar on the boat was open and people picnicked on the deck. It was a really ok way to spend three or four hours. Staying with the sister meant meeting new people and new dogs. All very friendly and easy to get on with though I did get teased about being a foreigner in my own country. Of course I made the usual jet lagged mistakes, looking the wrong way crossing the street, not understanding the money, putting the red wine in the fridge instead of the white and forgetting that you have to dilute the soft drinks with water. My Facebook friends are increasing hourly. All too soon my three days in Scotland came to an end and it was off to the airport, on the Tram. The tram is running finally in Edinburgh. About two years behind schedule and costing one billion pounds ($1.5 billion ish) it’s actually very slick. I have lived with the track laying over the years and watched, bemused, as the locals voted on whether or not to just ditch the project. The chaos it caused around the City was a sight to see. Everyone cussing and swearing as they were diverted around the workings. But now it’s finished and its marvelous, fabulous, a boon to the city and its really really popular. One thing tho, on the few days it needs it, including the day I rode it, it would be nice if they could turn up the air conditioning.